The Situation: GE wanted to position their brand as a leader and innovator in the Health and Environment space in a digitally engaging way. Insight and Strategic Approach: GE wanted to position their brand as a leader and innovator in the Health and Environment space in a digitally engaging way. The Health of Nations Program, which highlights the critical healthcare issues facing countries around the world, was created for GE's healthymagination by the Economist Intelligence Unit. 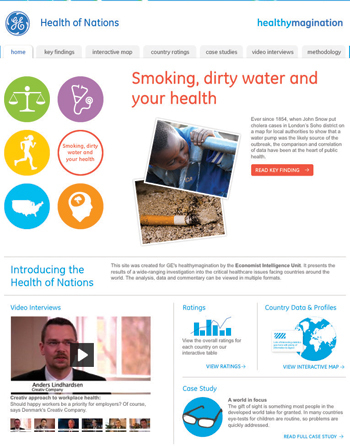 Through clever design and data visualization, the website (ge.com/healthofnations) at the heart of the program engages and educates the user while providing the desired brand exposure for GE. The program elements – data visualization, interactive map, country ratings, case studies and video podcasts − are cohesive, impactful and deliver on user expectations. The index The Health of Nations Index was built by the Economist Intelligence Unit in order to assess countries on their ability to meet the health demands of their populations. Its coverage extends to 50 countries, and the assessments are based on each nation's performance in 21 core indicators. Summarizing the complex nature of healthcare systems is extremely difficult in a single index. For one thing, the health challenges facing some countries are very different from those faced by others. These may derive from differing levels of economic development, climatic conditions, culture or other factors. For this reason, the Index is divided into three separate components: Healthcare Inputs, Outcomes and Risk. The Healthcare Inputs Index is comprized of seven indicators which measure the population's access to hospitals, doctors and other health personnel as well as key types of preventive medicine. The Healthcare Outcomes Index gauges the health status of populations by considering eight indicators covering mortality rates, the prevalence of diseases and nutritional health. The Healthcare Risk Index is based on the recognition that future demands on healthcare systems are influenced also by exogenous factors; this component thus considers such factors as smoking, access to clean water and air, and obesity levels. The Key Findings draw out specific trends from the data series and grapple with some of the big issues facing healthcare systems worldwide. They synthesize the data from the Health of Nations index with other research and explore the ramifications of the results. All case studies were based on research conducted by the Economist Intelligence Unit. Interviews for these, as well as all video interviews, were conducted between March and May 2010 at a variety of locations worldwide. Unless otherwise indicated, the country profiles are excerpted from Economist Intelligence Unit healthcare reports which appear on its Healthcare Briefings & Forecasts website. The profiles offer country-specific outlooks on healthcare spending and policy and issues surrounding disease, using the most recent available data. The Health of Nations sets a new standard for tailoring solutions that leverage the brand strengths of marketer and media partner, integrates the marketer with relevant, tailored content and ultimately provides new value to an appropriate audience. All involved pushed traditional boundaries and comfort levels from idea concept, specific executions, distribution of content, media planning and IT build. It was a successful program for all parties.